First licensed in February 1960, as KN4TSJ, while a student in junior high school in Norfolk, VA. Operated as a novice and upgraded to general within the required year. Remained active as K4TSJ until 1982 when an employment assignment meant Alaska for two years. During that period obtained the call AL7EL. Obtained K8XP while living in Michigan in 1997. Numerous employment assignments in the Federal Fire Service were in Washington, DC, Delta Junction Alaska, Aberdeen MD, Atlanta GA, and Watertown NY. Retired from the Federal Fire Service at the rank of Fire Chief with 30 years service in 1996. Now resides in Watkinsville, GA and provides consulting services to fire departments for operational readiness, organizational structure and fire origin and cause determination. Served in the US Army Active Reserve 1965-1971. Other interests include running, boating and flying. XYL Linda, KB2MFL. Extra Class; mode of choice- CW with primary interest in DX; DXCC total of 348. Responsible for all mechanical aspects of the operation. Will also work with N4RF on computer requirements and with N7RO on propagation predictions. Michael was first licensed in 1966 at age 11, and has held N6MZ since 1977. His previous calls were WN8TLH and WB8HZO. Michael is an avid CW DXer and contester, but also uses SSB and the digital modes occasionally. Michael enjoys building and experimenting, and has restored many tube-type "boatanchors," both amateur gear and commercial test equipment. He also enjoys modifying commercial amateur transceivers and published a QST article as a result of one of his many modifications to the ICOM IC-765. N6MZ also enjoys building and experimenting with antennas, and has field-tested several new antennas for Telex/Hy-Gain. He is a life member of the ARRL, a DXCC member (still looking for his last 10 DXCC countries! ), and a member of the Western Washington DX Club. Michael received his BS degree in electrical engineering from Ohio State, where he was very fortunate to work with and study under Dr. John Kraus, W8JK. Recently, N6MZ was one of the VK0IR DXpedition team members; he has also operated from FR5, FT5X, and SV5. When not chasing new ones, he loves sailing, scuba diving, bicycling, cross-country skiing, and opera. Mode of choice - CW with DXCC countries totals currently exceeding 315. First licensed in February 1965 as WN2RJJ at the age of 14. Upgraded to General in 1965 and to Extra in 1975. Obtained present call N2OO in 1976. Extremely active in local radio club activities for over 33 years holding many positions of responsibilities. Loyal interest in field day activities for many years. Very active in the DX area not only from his home QTH but also from many locations around the world. In addition to DXpeditioning, manages QSL's for some 50 calls, many which are from past DX operations. Currently serving as the EC for Ocean County, New Jersey (ARES). Trustee of the Ocean County RACES repeater 146.835 (835 User Group). Field Day Chairman for the Old Barney ARC. Life member of ARRL and married to Beth, KF2BQ. Emplyed by Bell Atlantic with 28 years of service in the Central Office. Other interests include fishing and boating, camping, gardening and pets. DXCC is #1 Honor Roll. DXCC Totals: 342. Other awards include WAZ, WAS and 5BWAS, Contest activities include winner of several major contests. First licensed in 1976 as WA2JXK at the age of 16. Relocated to Ormond Beach Florida in 1977. Issued WD4GDZ in 1977. Obtained present call, N2WB under vanity in 1996. Holds Extra class. 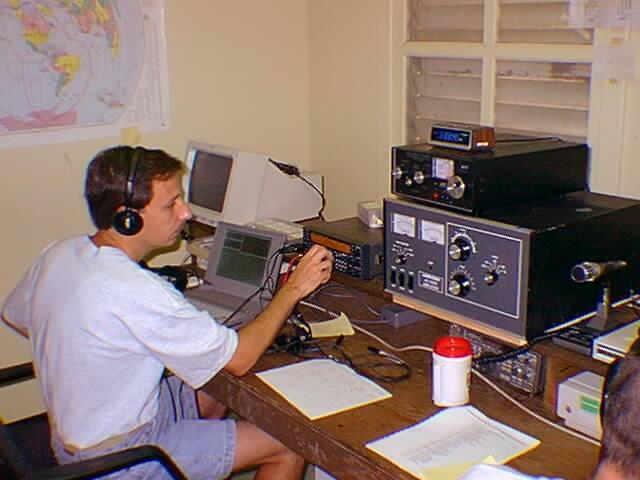 Active in DX circles with avid interests in contesting and RTTY, satellites and low band operation. Other related interests are antenna and tower work. A life member of ARRL, currently serving in the ARRL and W5YI VEC programs. Also active locally in the Central Florida DX Association and the North Ormond Beach Amateur Radio Society. Married to Dawn, KB4NOA, with one son, Billy, age 11. Other interests are traveling, computers and gardening. Contest winner for 1995 and 1996 ARRL SS North Florida First Place, Multi OP Phone.